SGPGIMS Lucknow Recruitment 2018: Online applications are invited from eligible candidates for filling up 178 LDA/Steno vacancies. Those candidates who are interested in SGPGIMS Lucknow Recruitment 2018-19 can apply for current jibs through its official website that is www.sgpgi.ac.in. Official notification is published by Sanjay Gandhi Post Graduation Institute of Medical Sciences as Advt. No: PGI/I-33/Rectt./2017-2018 & I-25/Rectt./2018-19 on its official portal. Applicants are advised to go through the same and ensure their eligibility before applying online for SGPGIMS Lucknow Recruitment. Apply Online for SGPGIMS LDA/Steno Vacancies till 05-09-2018!!! Applicants who want to apply and join a reputed institute of medical science are required to complete their registration process first by following below explained steps or may also visit the direct official links provided here which will be activated till 05-09-2018. All the important details and required information regarding SGPGIMS Lucknow Recruitment 2018-19 are provided here in the below section of this page by the dedicated members of www.privatejobshub.in. Applicants who are willing to apply for SGPGIMS Recruitment must have pursued Graduation/Post-Graduation/Master’s Degree/Diploma in relevant fields as per the requirements of the post they have to apply for. Those candidates who want to get recruited for SGPGIMS Lucknow vacancies of LDA/Steno are informed that they will be considered eligible only if their minimum and maximum age resists between 21 and 40 years of age as on 01-01-2018. Below provided table shows the details regarding salary structure per month for the vacant positions in Sanjay Gandhi Post Graduation Institute of Medical Sciences. Screening committee of the organization is going to hire eligible candidates on the basis of their performance in written test/personal interview/skill test/practical test/technical test. Applicants will be informed officially for the schedule of the respective stage of selection. Contenders who belong to SC/ST categories are required to pay an amount of Rs.300/- and those who belong to unreserved or OBC category have to pay Rs.500/- towards their online application form which is to be paid through online mode only. How to Apply Online for SGPGIMS Lucknow Recruitment? 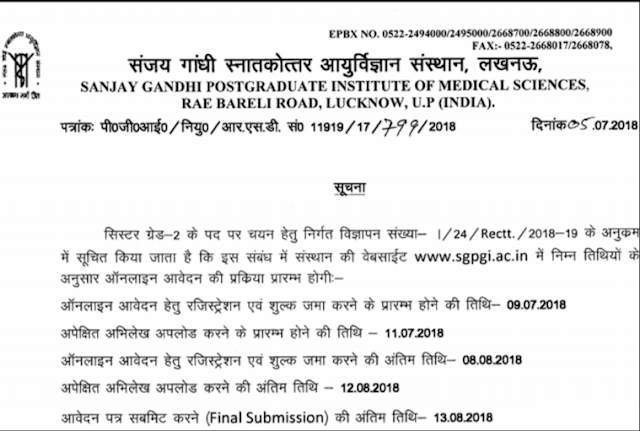 Firstly, contenders need to visit the official website of Sanjay Gandhi Post Graduation Institute of Medical Sciences that is www.sgpgi.ac.in or the direct link provided below to fill their SGPGIMS Lucknow online application forms. Go through “Announcements” section provided in the mid of the home page and search “Apply Online for various non-teaching Posts” link from various links provided there. You will be navigated to page where you will get details regarding vacant posts, for detailed advertisement you need to press “Advertisement” tab provided on the menu bar. Now read the entire notification carefully and if you are found eligible as per the requirements of the organization for SGPGIMS Lucknow Recruitment the go back to the previous page and move the cursor towards “Online Submission”. Hit the suitable link to fill online application forms and you will be navigated to another page. Register into the official portal and fill the required details in the application form correctly and go for application fee payment. After uploading all the required documents hit the “Submit” tab and also take print out of the duly filled in application form for future reference. We hope the above provided details are beneficial and enough for the candidates who are going to apply for SGPGIMS Lucknow Recruitment 2018-19. They are advised that they must visit its Official Website on regular basis. SGPGIMS Recruitment 2018: A career notice about SGPGIMS Recruitment has been initiated in order to hire eligible and skilled candidates. As per SGPGIMS Notification, online applications are invited to fill 495 posts of Sister Grade II jobs. Interested candidates for SGPGIMS Lucknow Recruitment can apply online but before that you should go through SGPGIMS Advertisement and check all eligibility conditions. Those who satisfy all norms can further submit SGPGIMS Online Form on or before 13-08-2018. Application forms that are submitted in prescribed format along with all relevant documents and are eligible will be called for SGPGIMS selection process. SGPGIMS will recruit candidates on the basis of performance in written test and interview. For detailed information about SGPGIMS Recruitment 2018-19 go through below section of page that is well created by the dedicated and committed team members of www.privatejobshub.in. Job seekers who are interested to apply for SGPGIMS Sister Grade II Recruitment should hold the Diploma in General Nursing & Midwifery from a recognized Institute or B.Sc. Nursing and registered A Grade Nurse & Midwifery with a State Nursing Council to become eligible for the SGPGIMS Vacancy. Age of applying candidates for SGPGIMS Sister Gr- II Recruitment should be between 18 to 40 years of age. Relaxation in age will be given to reserved category candidates as per the rules and regulations of government. Aspirants applying towards SGPGIMS Lucknow Recruitment are also required to pay requisite amount towards application fee. Fee must be paid through proper mode before the last date. Selection of applied candidates towards SGPGIMS Lucknow Sister Grade II Jobs will be done on the basis of performance in written test. 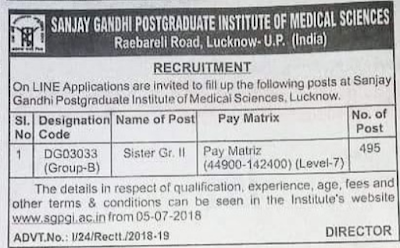 Those who will get qualified in test will be further called for personal interview round that will be conducted by the recruitment panel of Sanjay Gandhi Post Graduation Institute Of Medical Sciences, Lucknow. Recruited candidates for SGPGIMS Sister Grade II Vacancies will receive attractive and satisfying amount of pay scale that is Level -7 as Rs. 44900 – 142400/- per month through management panel of Sanjay Gandhi Post Graduation Institute Of Medical Sciences, Lucknow. First and foremost step is to login to home page of Sanjay Gandhi Post Graduation Institute Of Medical Sciences, Lucknow that is www.sgpgi.ac.in to apply for SGPGIMS Lucknow Recruitment 2018. Now, follow “Announcement” section that is available in mid- section of page. Under that, press suitable link for Advt No. I/24/Rectt./2018-19 towards SGPGIMS Sister Grade II Recruitment 2018. By pressing suitable link, SGPGIMS Notification will appear. Aspirants can go through SGPGIMS Advertisement and check the eligibility conditions. Eligible candidates can further apply online and fill SGPGIMS Online Application Form. Finally, hit submit tab and take the hard copy of SGPGIMS Online Form for future use. To know more information about SGPGIMS Recruitment 2018-19, candidates are advised to check the Official Link for other details of SGPGIMS Lucknow Recruitment 2018-19. Join us on Facebook or Google+ to get latest and instant updates.